I want to thank Burlington Edible History Tour for their warm hospitality. I was their guest on this tour. 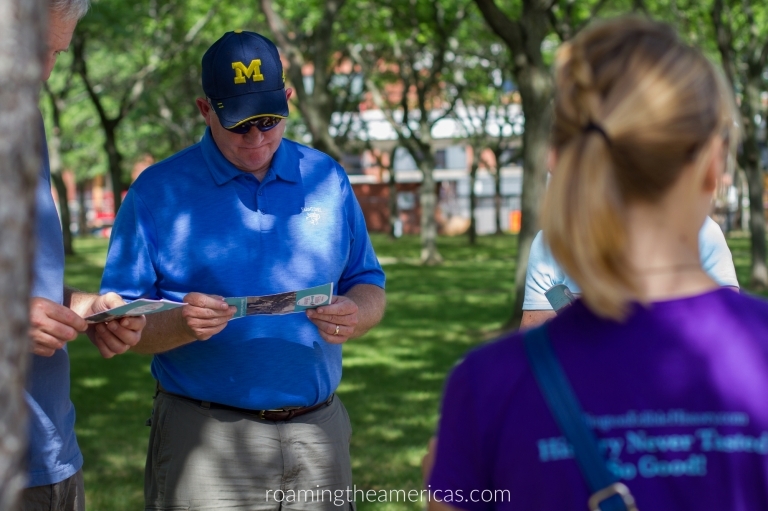 I talked with other tour participants and took into consideration the rave reviews they had to offer as well as my own experience. I was not required to give a positive review, and all opinions expressed are my own. I squinted and maneuvered into the shade to slather on more sunscreen, resigning myself to the fact that I’d probably burn anyway since I’d be outside for the next 3 hours. Several others had already gathered around, and we started chatting about where we were all from and what brought us to Burlington that week. Carolyn, our guide, smiled brightly and let us know that we had a few other tour participants we were waiting on. And, she assured us that we’d try to stay in the shade as much as possible. I already liked her. I haven’t been on many tours—I generally try to avoid things that sound like the word tourist. 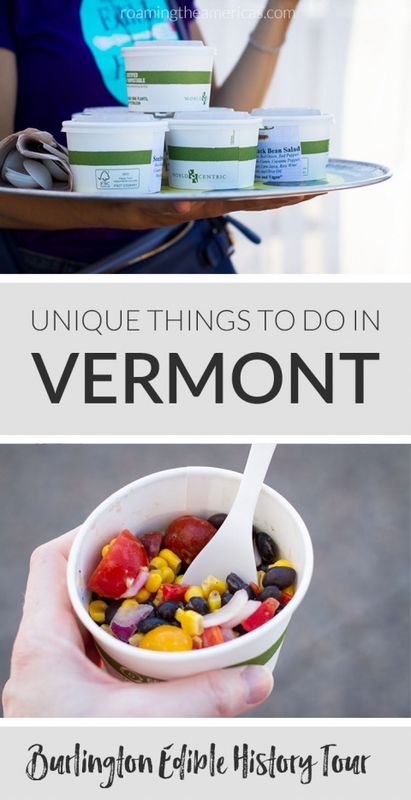 But when I was researching things to do in Burlington, Vermont, this very intriguing walking food tour came up. It seemed to be the intersection of many of the things I write about here—bringing together learning, farm-to-table food, and multicultural history—and aligned well with my philosophy of responsible travel. So I was hopeful that even though this was a tour, it wouldn’t be touristy. I wasn’t disappointed. We started the Burlington Edible History Tour walking up the hill away from the waterfront, symbolic of the way various immigrant groups had moved in Burlington throughout history—away from the waterfront as they gained more wealth and stature. In an ironic twist of history, what is now the gorgeous Lake Champlain waterfront was once the part of town where the poorest groups lived. As we walked up the gradual incline toward our first food stop—an out-of-this-world yogurt-filled sandwich at Maglianero Cafe (made by Jam Bakery)—Carolyn told us about the Lebanese and their ice business in this part of town. I tried to imagine Lake Champlain frozen over as I looked down at it, and how in the world they harvested 300 pound blocks of ice without modern tools. As we continued up the hill, she paused in front of a brick house to tell us about one of the early Lebanese families in Burlington, the Fayettes, who had lived there. Aneica Fayette was a “matriarch of the neighborhood” and invited women over to her house several times per week for a game most people imagine men playing (you’ll have to go on the tour to find out what it was!). I chuckled when I heard this as I imagined what a character she seemed like. We also heard about the Irish, French Canadians, Jews, and more, including Abenaki foods that are still being grown in pockets of Vermont. We learned why temperance led to such a thriving microbrewery scene in Vermont today and how building an ugly parking garage affected the Italian community. Over the course of a few hours, we walked at a leisurely pace and the conversation and questions flowed naturally into the tour. The mark of a good guide, in my opinion, is that they’re interested. When several people in our group complimented Carolyn on what a great tour she gave, she thanked them and simply said, “It’s easy when you have such an interesting topic.” Clearly she found the story of Burlington intriguing, and she wove details into the big picture story as we walked the two miles over the course of several hours. While Vermont is still noticeably not racially diverse, it has had a significant population of foreign-born residents throughout its history, and various ethnic groups have contributed to its development. This diversity has led to political strife, cultural divides, and deeply rooted food traditions that were woven into daily life and still show up in interesting ways in Burlington today. When Gail started digging to find out more about Burlington’s multi-cultural history, she couldn’t find much about food traditions from various cultures. So she decided to do her own original research and asked for Elise’s help. 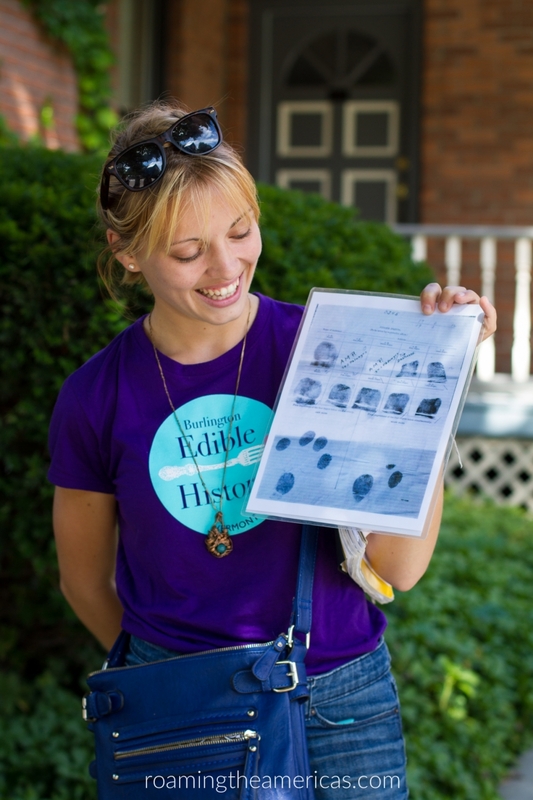 The Burlington Edible History Tour was born out of many trips to the library (losing track of time reading census records and early Vermont cookbooks), digging into city directories, and interviewing the descendants of Burlington’s early immigrants over the course of about a year. 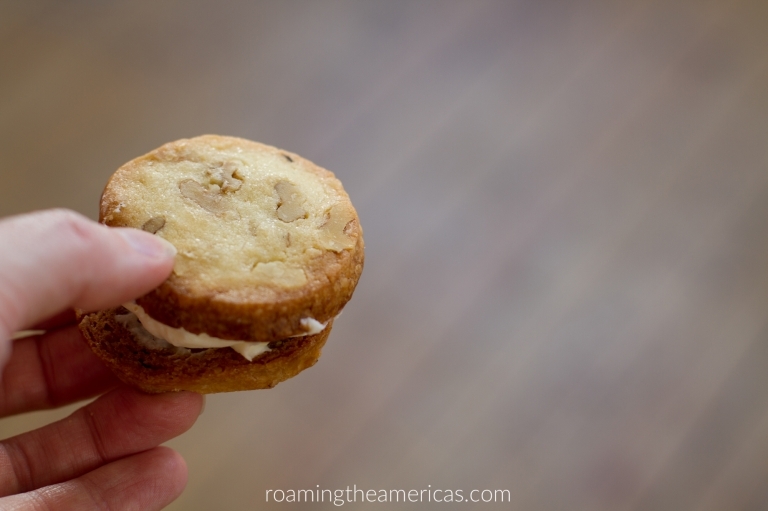 I’ve shared before how important I think it is to learn some history about a place before (or during) your trip, and the Burlington Edible History Tour is the perfect way to do that. It made me curious about buildings and restaurants and events that would have otherwise seemed ordinary. It changed my perspective as I walked throughout Burlington during the rest of my trip and brought a lot of depth to my experience of the city. This tour is anything but a boring history lecture or walk through a dry museum–it combines thorough research with passion from the founders and guides for a truly interesting story of Burlington. I highly recommend it for anyone who wants to understand more of Burlington’s culture (and eat some delicious food along the way)! Get more information at the Burlington Edible History Tour website. The 2018 season runs from June 14th to Oct 13th, and tours are being held on Thursdays, Fridays, and Saturdays from 1:00 – 4:15 PM in Burlington, Vermont. Tours go on rain or shine. Please check the website for current information and to purchase tickets. 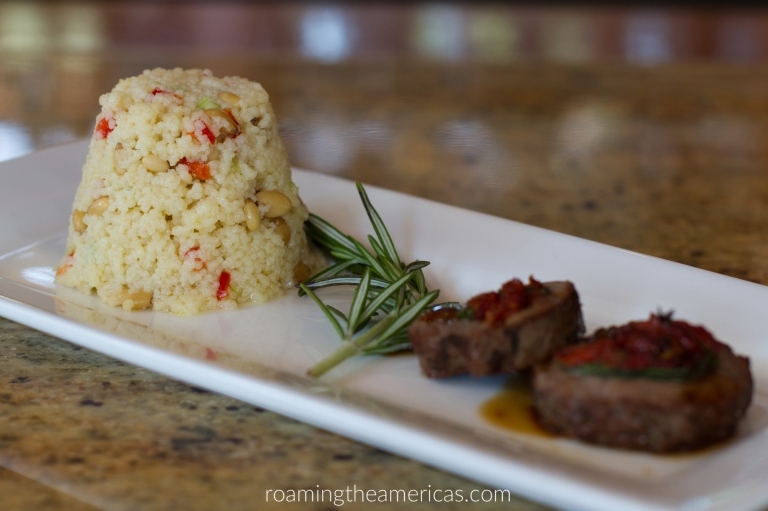 The tour donates 10% of profits to the New Farms for New Americans project, which provides affordable farm land to refugees so they can stay connected to their own culinary traditions and crops.